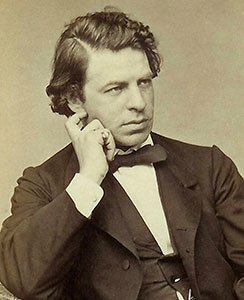 Joseph Joachim (1831-1907) is one of the iconic figures in the history of violin playing. A much admired friend and younger colleague of such great musical figures as Mendelssohn, Schumann and Liszt, he enjoyed a particularly close relationship with Johannes Brahms, who often sought Joachim’s advice. Joachim, moreover, was not only an artist beloved by musicians and audiences alike for his performances of solo repertoire, chamber music, and concertos. Through his teaching, editions and compositions, he also became an essential embodiment and custodian of the “German spirit” in music, the almost religious devotion to “classical” values and fealty to the written text, this even though he was born not in Germany or Austria but in Hungary to Jewish parents. A full assessment of Joachim has been long overdue, and a conference for this purpose was held at the Goethe-Institut June 16-18. Titled “Joseph Joachim at 185” and co-directed by Robert Whitehouse Eshbach and Valerie Woodring Goertzen, the three days were filled with 21 scholarly papers and two lecture recitals that examined just about every aspect of Joachim’s life and career as a violinist, teacher, composer, and mentor. It is not possible to describe each of these events in detail [full list here], but all them added to our knowledge and appreciation of the art of Joseph Joachim. The opening address by Eshbach, a leading Joachim scholar, reminded us that Joachim “was a beloved, avuncular eminence … a virtuoso performer who stressed the importance of interpretation over virtuosity,” and who was seen as a sage and “musical priest” throughout the Western musical world. Eshbach also lamented, justly, that “… musicology has not kept up with Joachim” and that “much about his life and legacy remains to be re-evaluated or explored.” The conference was a great step forward. New York-based musicologist Styra Avins spoke about Joachim’s baptism into Lutheranism in 1854, placing it within the context of “the cultural climate in German-speaking lands in which that decision was made,” including the Haskalah, “the German-Jewish Enlightenment movement that first found its voice in Moses Mendelssohn.” An added benefit from this paper was Avins’s reference to first BSO conductor George Henschel, another German Jew who had been baptized and lived his public life as a Christian. Nevertheless, in a visit to Henschel’s music studio in Scotland, Avins discovered a menorah over the doorway, and four stained-glass windows inside, each emblazoned by a Star of David, with the words “Until the Very End” running throughout. Several papers dealt with Joachim’s compositions connected to the works of Shakespeare, such as the Overture to Shakespeare’s Henry IV (Woodring-Goertzen) and the Overture to Hamlet (Jacquelyn Sholes). There were multiple discussions about Joachim’s violin concertos. Robert Riggs pointed out that Donald Francis Tovey, who held Joachim in such reverence that he always called him the “Great Man,” considered the Concerto in D minor (in the Hungarian Manner) “one of the most important documents of the middle of the 19th century.” Riggs directed our attention to the possible influences of this concerto on Brahms’s Piano Concerto No. 1. Vasiliki Papadopoulou also examined a Brahms connection with Joachim’s Violin Concerto in G minor, op. 3. Despite Joachim’s impeccable reputation as an artist, several aspects of his personal life are less attractive. Hamburg scholar Beatrix Borchard, who has published a joint biography of Joachim and his wife, the great singer Amalie Schneeweiss (Stimme und Geige [Voice and Violin]: Amalie und Joseph Joachim), documented that Joachim treated his wife with unjustified suspicion and disrespect, and ultimately divorced her. In her conference paper, Borchard discussed Amalie’s groundbreaking series of performances tracing the history of the German Lied, which she presented to great success in Europe, Russia, and the United States. The lecture-recital by Swiss scholar/performers Kai Köpp, Johannes Gebauer, and Sebastian Bausch (“Der Klassikervortrag—Re-enacting the Art of Joseph Joachim”) offered results from their four-year research project in which they used analysis of “instructive texts and editions of the Joachim school,” methods of “embodiment” and “re-enactment,” and some high-tech graphs and images to add insights into performance practices of the time. A paper given by Ian Maxwell (Cambridge UK) described the newly formed Joachim archives at the University of Edinburgh, something that will be of great interest to scholars. The closing paper, by Arthur Kaptainis, was quite touching. The legendary pianist Arthur Rubinstein, who as a young prodigy was mentored by Joachim, recalled “sitting on a windowsill in Germany listening to the Joachim Quartet play Op. 18 no. 2.” Kaptainis told us that when members of the Juilliard Quartet visited Rubinstein in 1982 less than seven months before his death, they played at his request that same quartet, as well as Beethoven’s Opus 59 no. 1 and three movements from Opus 95. Such were the importance and influence of Joseph Joachim both during his lifetime and for future generations. Carol Lieberman and Mark Kroll have been performing together since meeting at the Yale School of Music. 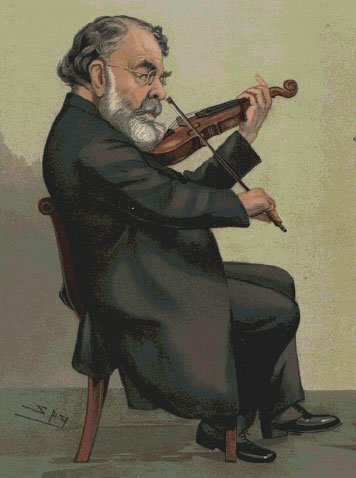 Lieberman became the first violinist to receive the DMA from Yale. The two continue to tour worldwide, playing violin / keyboard repertoire from the 17th to the 21st centuries. A valiant report of a complex and jam-packed three days! Two tiny corrections: Joachim’s “turn” to Evangelical Lutheranism occurred in 1855, not 54. The date makes a difference if one is trying to understand the complexities of his decision. And Joachim tried, but in fact failed in his attempt to divorce his wife: the judge found against him, exonerating Amalie. They separated legally for the rest of their lives. One of the participants in the conference, the presenter of the paper about Joachim and the Haskalah.